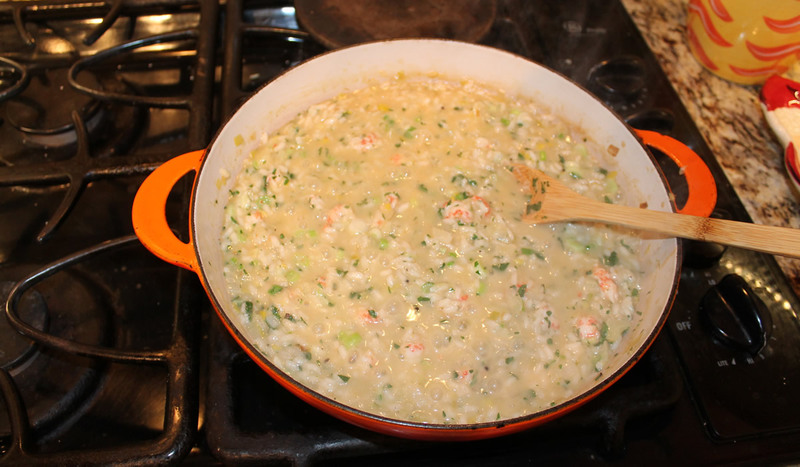 I was thinking seafood of some sort for dinner tonight, when I realized it’s been a while since I made risotto. Time to combine the two ideas and make a shrimp risotto, right?!? Right! 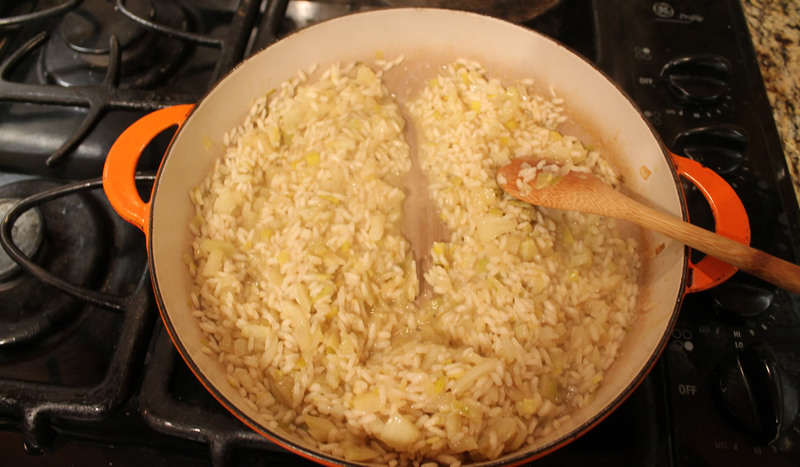 Risotto really is one of the easiest dishes in the world to make. I think it has a difficulty-reputation because restaurants want to be able to charge a lot of money for rice. Even designer-rices are relatively inexpensive. 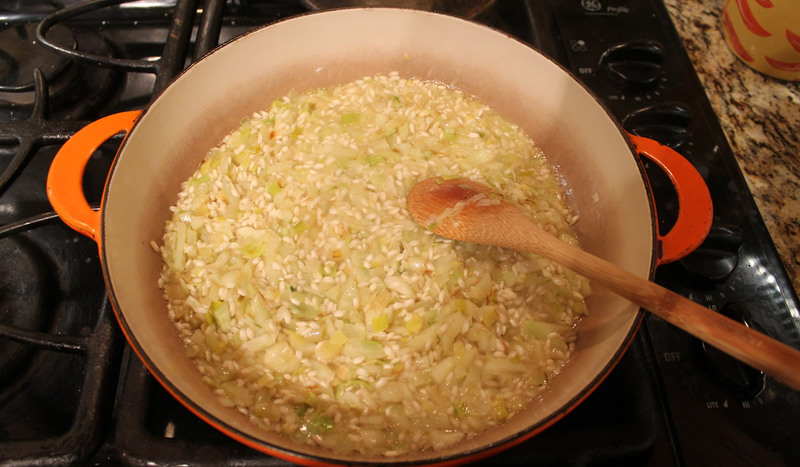 I like to use carnaroli rice for risotto – it’s pretty much the top of the line risotto rice. Besides being a lot more forgiving, it’s also creamier than the easier-to-find arborio. When I can find it, I’ll also use vialone nano – another rice that hails from the north of Italy – but all you really need is a short-grained rice. Don’t tell the food snobs, but you can even use a paella rice like calaspara or bomba if that’s what you have in the house. You just don’t want to use a basic long-grained rice like Uncle Ben’s or something like jasmine or basmati. From there, it’s just a bit of technique. 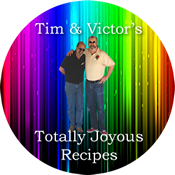 You start by cooking off your onions or other hard vegetables, add rice and cook it a bit until it begins to get translucent, add some wine, then hot broth by the half-cup, making sure it is absorbed before adding the next. Add other ingredients, as desired, a bit of grated cheese, and it’s ready to eat! Maybe 30 minutes start-to-finish. Saute onion and garlic in a bit of olive oil and butter. Add rice and cook until translucent, stirring continually. Add wine and cook until almost fully absorbed. Begin to add broth by the ladle, stirring continually. Continue adding ladles of broth as the last one is absorbed, until rice is just tender. Run your spoon down the pan. When it leaves a trail, it’s time to add more broth. At this point, stir in shrimp and cook it in the rice. Add parsley and cheese, stirring well. Taste for seasoning and add salt and pepper, as desired. It’s a very forgiving dish and a great way to use up leftovers!